In value terms, the NPAs of these 26 banks were Rs 7.31 lakh crore and have increased by Rs 2.5 lakh crore this year over March 2017. In FY17, the gross NPA stood at nearly Rs 4.82 lakh crore. 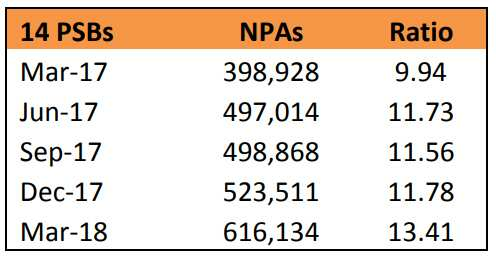 Most of the banks have announced their fourth quarter ended March 2018 financial performance, and looks like there was no surprise during this period as their major issue gross non-performing assets (GNPA) continues to rise further. Indian banking system has been hit by massive stressed assets since past three fiscal, which has resulted in higher provisions, single digit credit growth and weak earnings. A total of 26 banks including largest lender State Bank of India (SBI) has showcased their financial results so far. 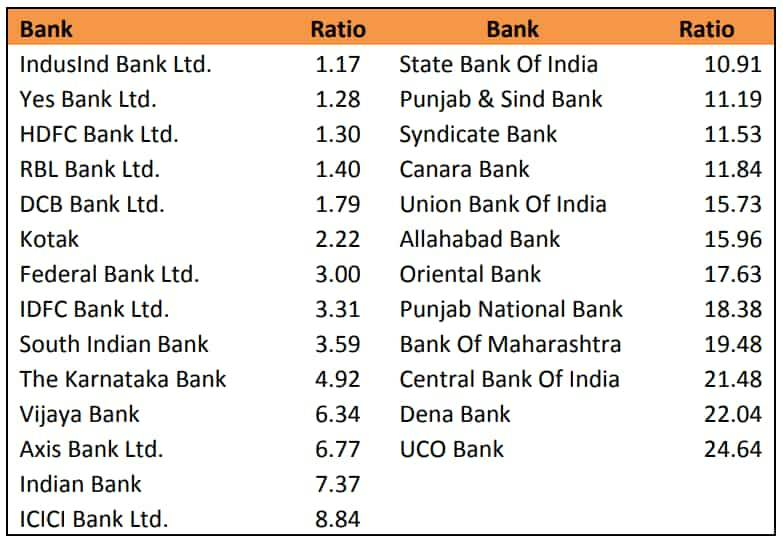 Rating agency Care Ratings carried gross NPA analysis of these 26 banks which included 14 public sector banks (PSBs) and 12 private banks. According to a Care Rating report, after moderating from 9.04% in June 2017 to 8.93% in September 2017, the ratio has ascended subsequently to peak at 10.14% in March 2018. Among the total, the NPA rates of PSBs were as usually higher compared to private banks. While the ratio remained stable in the range of 11-12% in the first three quarters of FY18, it has increased by 163 bps in Q4 to 13.41%. In value terms these 14 PSBs recorded gross NPA of Rs 6.16 lakh crore by end of March 2018. For private banks too NPAs have spiked in March 2018 after moderating in December 2017 relative to September 2017. As on March 2018, gross NPA of 12 private banks were nearly Rs 1.15 lakh crore with a ratio of 4.40% - which surged from Rs 82,981 crore in FY17 having a ratio of 3.84%. Interestingly, this FY18, 12 banks had Gross NPA ratio of above 10% and all are in the public sector. 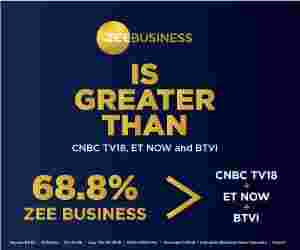 These PSBs were - Uco Bank with GNPA ratio of 24.64%, followed by Dena Bank at 22.04%, Central Bank of India at 21.48%, Bank of Maharashtra at 19.48%, Punjab National Bank at 18.38%, Oriental Bank of Commerce at 17.63%, Allahabad Bank at 15.96%, Union Bank of India at 15.73%, Canara Bank at 11.84%, Syndicate Bank at 11.53%, Punjab & Sind Bank at 11.19% and SBI at 10.91%. Lenders like Karnataka Bank, Vijaya Bank, Axis Bank, Indian Bank and ICICI Bank had gross NPA ratio ranging from 4% to below 9%. Four lenders namely Kotak Mahindra Bank, Federal Bank, IDFC Bank and South Indian Bank have GNPA between 2% to below 4%. Top five banks who had lowest GNPA were - DCB Bank with 1.79% ratio, RBL Bank with 1.40%, HDFC Bank with 1.30% and Yes Bank with 1.28%. IndusInd Bank has the lowest NPA ratio of 1.17% as on March 2018. Total provisions made during the year (of which the most would be for NPAs) increased from Rs 43,611 crore to Rs 105,150 crore - an increase of 141%. Results are awaited for the other banks which include Bank of Baroda, Bank of India, IDBI Bank, Corporation Bank, IOB, United Bank, Andhra Bank in the PSB group and City Union, Dhanlaxmi, Karur Vysya, Laxmi Vilas and J & K in the private sector.